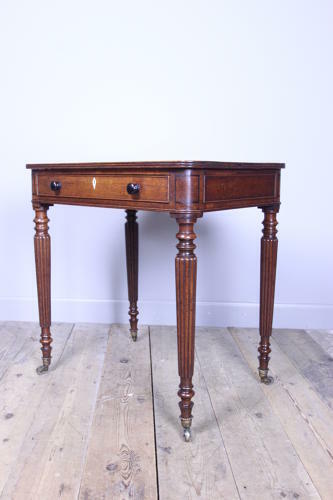 A beautifully proportioned Oak chamber table attributed to Gillows of Lancaster. The Oak top having geometric Ebony line inlay complete with lift up compartment for writing material, finshed with a reeded edge. Retaining the original Ivory escutcheon, knob handles and lock, raised on slender turned and reeded tapering legs terminating in brass cup castors. This particular table in Oak with Ebony inlay makes this a highly unusual and rare example. English, Circa 1815. This design of table shows several times in the Gillows sketch books. The first is believed to have been ordered for a T W Egerton of Tatton Park Cheshire in 1811. Dimensions: Height: 74.25 cm (29 1/4 Inches), Width: 72.5 cm (28 1/2 Inches), Depth: 51 cm (20 Inches).